2014 Subaru Forester and 2013 Mitsubishi Outlander Sport earn Insurance Institute for Highway Safety (IIHS) TOP SAFETY PICK honors for their performance in the small overlap front crash test. The Forester was the only vehicle of 13 small SUVs tested to earn an overall rating of “Good” in the test and the Outlander earned a rating of “Acceptable”, while the other 11 vehicles tested received marginal or poor ratings. 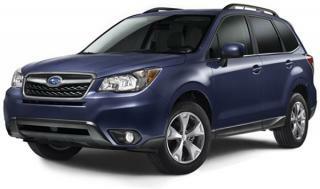 The Forester also received a rating of Good back in 2003 in the Institute’s first small SUV tests for side protection. The small overlap front crash test replicates a crash where the front corner of the vehicle hits another vehicle or a stationary object like a light post, wall, or other barrier. According to a 2009 IIHS study of vehicles with good performance ratings for front crash protection small overlap crashes made up almost 25% of serious or fatal injury frontal crashes. This is likely due to the fact that impact at the front corner of the vehicle misses the main structures designed to absorb impact. This increases the chance that the occupant compartment will collapse and result in injuries to driver and passengers. Small overlap front crashes also have a tenancy to spin, with the driver’s head lunging toward the door, away from the airbag. Side curtain airbags help to protect the driver but in several of the tests the side curtains didn’t deploy on impact. Of the small SUVs tested two thirds were ranked poor for structure in the small overlap front crash test and half were poor or marginal for restraints and kinematics, resulting in the dummy striking hard surfaces in the vehicle. The Forester was the only vehicle to receive a good rating for all aspects of the test including injuries and the Outlander Sport was rated acceptable for structure and restraints with good injury results. See more about the test results in this video from the IIHS.